This week at Tuesdays With Dorie (TWD), we are making a sweet dessert, Coconut Tapioca pudding which uses large pearl tapioca. I got to admit, I was really surprised to find a tapioca pudding dessert among Dorie's French recipes, as tapioca is usually used in Asian desserts. 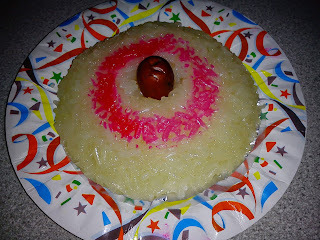 Tapioca desserts are quite common in Malaysia. I have however never tried making tapioca pudding using the combination of coconut milk and milk, so I was looking forward to try this. I made this dessert twice. Large pearl tapioca is first soaked in cold water and keep overnight in the fridge. The next day, drain the pearls and put in a small pot with coconut milk, milk and sugar. Some of the pearls have broken up, while some remained whole. Stir over low heat till the sugar melts and continue stirring until the tapioca is translucent and the mixture thickens. It takes about 10 to 15 minutes. Stir in vanilla extract and scoop into serving bowls. The first time I made this, the texture is rather thick, though it tasted really delicious! It has the consistency of a very thick custard. My son was asking for it again a couple of days later, and the second time I made it, I added a pinch of salt and a little extra milk so that it is not as thick as the first time I made it. Once the consistency is to your liking, scoop into serving bowls. Do take note that upon cooling and refrigeration, the texture will get a little thicker. These pudding can either be served warm, at room temperature or chilled. The pudding is very creamy and silky, from both the coconut milk and milk, the soft chewiness of the translucent tapioca pearls is the star here, and with the right amount of sweetness. The vanilla extract really adds a lovely fragrance. This is one delicious dessert! While the family love having it chilled, I prefer having it at room temperature. Either way, this is yummy! Do visit Tuesdays With Dorie (TWD), to see the other ladies' take on this yummy dessert. 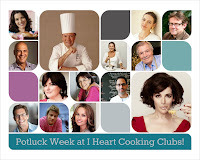 "April Potluck", the theme for this week at I Heart Cooking Clubs (IHCC). 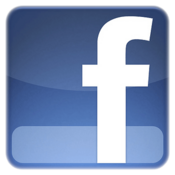 Free and easy theme, we get to cook and select any recipes from any of IHCC's past and present chefs. I've decided to cook one of Nigella Lawson's chicken recipes for our Sunday night dinner. One thing I like about Nigella's recipes are her chicken recipes! Chicken breast fillet is first flattened (I use a meat mallet) between two sheets of plastic, to a thin piece, then soaked in a mixture of buttermilk and Worcestershire sauce. I did not have any buttermilk, so I've used milk mixed with 1 tablespoon lime juice, stir and let sit for 5 minutes before use. I soaked the chicken breast fillet for about 4 hours, keeping them covered in a shallow container in the fridge. Just before frying the cutlets, prepare the crumb mixture by mixing breadcrumbs (which I've used Panko), grated Parmesan cheese, celery salt, cayenne powder and dried thyme in a large shallow plate. I fry the cutlets just before serving time. Lift the chicken pieces out of the buttermilk mixture and place them on the crumb mixture, coating both sides of the cutlet. Heat some oil, about 1/4 inch, in a large saucepan, and fry the chicken cutlets on both sides over medium-low heat, until brown and cooked. Drain on absorbent paper towels and serve immediately. I fried a small piece of the cutlet to test on the seasoning before frying the rest of the cutlets, and find that I needed to add a little bit more of celery salt and the dried thymes, to the crumb mixture, to taste. I thought that the Crisp Chicken Cutlet from the photo above looks like a piece of toasted bread! LOL! I served these cutlets with a simple green salad and some potato salad. Sprinkle some fresh thyme over the cutlets, as I did not have any parsley. This meal is a total winner! The chicken cutlet is crispy on the outside, with moist and tender meat after soaking in the buttermilk for a few hours. Tasty and delicious! We enjoyed this meal and I would make this again! Unroll a piece of plastic wrap, then open out the chicken breasts and lay them on the plastic. Cover the fanned-out chicken breasts with another piece of plastic wrap, and bash with a rolling pin until they are thin, but still whole. (if the underside sections come away, don't worry). Whisk the buttermilk with the Worcestershire sauce in a shallow bowl, or put it into a resealable bag and squish to mix. Then add the flattened chicken pieces to the bowl or bag and leave out for about 30 minutes - or refrigerate overnight if you've got time - to marinate. Preheat the oven to 300F, if you're using a smaller frying pan and want to keep the cutlets warm as you fry them. Mix the breadcrumbs, celery salt, cayenne, thyme, and Parmesan in a wide, shallow dish. Then, once the chicken has had its steeping, lift out the buttermilky pieces and press into the breadcrumbs mixture one at a time. Coat the chicken on both sides with the seasoned crumbs and then lay them on a wire rack, the sort you'd use for cooling cakes. Heat the oil in a frying pan - using just enought to coat the base with about 1/4 inch of oil. Once the oil is hot, fry the bigger pieces of chicken for about 3 minutes per side, and the smaller bits from the underside of the breast for about 2 minutes per side. As you remove the cooked pieces of chicken, blot them on paper towels and, if you wish, keep them warm in a low oven (on a cookie sheet) as indicated above, or serve them as you go. However you choose to dish up, serve these crisp chicken cutlets sprinkled with chopped parsley. I'm linking this post with I Heart Cooking Clubs (IHCC), theme for this week "April Potluck"
Little Thumbs Up : Chicken, organised by Bake for Happy Kids and My Little Favourite DIY, and hosted by Diana from the Domestic Goddess Wannabe. Bake-Along #77 theme bake is Theme : Viennese Shortbread, selected by Zoe to bake together with Lena, myself and everyone is welcome to bake-along with us. Viennese Shortbread sometimes are called as Viennese Fingers, Viennese Biscuits and Viennese Cookies, and they are tender, buttery shortbread that can be sandwiched with butter cream, jam or dipped in melted chocolate. Or have them plain, like I did, my favourite way of eating them. These are really easy to make. The soft batter is made up of butter, flour, confectioner's sugar, baking powder and vanilla extract, which is then stuffed into a cookie press, (I use a piping bag and a star nozzle), and pipe into strips about 2-3 inches long on a non-greased baking sheet. Bake as directed in the recipe, though mine took about 12 minutes as I baked them a little longer than the recipe states as I want them a little more crispy. ....they seem to flatten a little! I was prepared for this actually, as the batter was quite soft. Not very "pretty" after baking! When the fingers have cooled off completely, dip the ends with melted chocolate. Originally this recipe comes with a butter cream filling, which I have skipped. My daughter love having these Viennese Fingers with the ends dipped in melted chocolate. As for me, I prefer them plain. These are so yummy, even though they are a little flat! When I make this again the next time, I would make them as rounds, at least they would look like cookies! I used salted butter, so these fingers has a salty buttery taste, tender with a light crisp. Wonderful with a cup of tea for a tea-time treat. And I had it the next morning with a mug of hot black coffee. 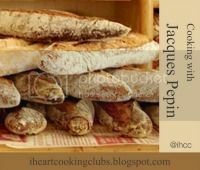 On a waxed sheet of paper or in a bowl, combine flour and baking powder. Set aside. In a large bowl, using an eletric mixer on medium, speed, beat butter, confectioners' sugar and vanilla until light and creamy, about 3 minutes. On low speed, gradually add flour mixture, beating until smooth. (The dough should be slightly soft so it can be pushed through a cookie press easily. If it is too stiff to press easily, mix in another tablespoon of softened butter. If it is too soft, add a little flour). Pack dough into fitted cookie press and press into strips about 1-1/2 inches (4cm) long, about 1 inch (2.5cm) apart on cookie sheet. Bake in preheated oven for 5 to 7 minutes or until starting top brown around edges. Cool for 5 minutes on sheet, then transfer to a rack and cool completely. For our next Bake-Along, we will be baking based on a theme; "Theme - Bake-Along 4th Anniversary Theme : Cheesecake". 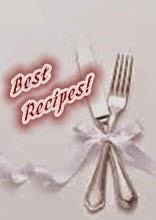 Please do join us, bake any Cheesecake recipe, and link your post to our linky which will start on 7th May till 16thMay. Everyone is welcome to join us! Only current post please. Super easy dish to cook! All you need to do is chop up all the veggies (zucchini, eggplant, bell peppers, onions) and with all the other ingredients goes into the pot, cover and simmer away for about 30 minutes. Season with salt and pepper and it is ready to be served over pasta. Serve it over penne for one of our weeknight dinner. I've forgotten to add the black olives, oh well, we like it anyway! For the ratatouille : Put all the ingredients in a large saucepan and bring to a boil over high heat. Mix well, reduce the heat to low, cover, and cook gently for 30 minutes. If the mixture still has a lot of liquid, reduce it by boiling, uncovered for 3 to 4 minutes. Cool to room temperature. You will have about 5 cups. For the penne : Bring 3 quarts salted water to a boil in a large pot. Add the penne and stir it well, so it doesn't stick together. Return to a boil, stirring occasionally, and cook for 10 to 12 minutes, or until it is cooked to your liking. Meanwhile, combine the ratatouille, 3/4 teaspoon salt, pepper and olive oil in a large glass bowl and microwave for a couple of minutes to warm it through. Drain the pasta and add it to the ratatouille in the bowl. Sprinkle on the olives and the cheese and mix well. Divide among four hot plates and garnish with the basil and grated cheese. Pass more at the table. Note : To serve the ratatouille on its own, spoon it into a serving dish, drizzle on a little extra-virgin olive oil, sprinkle with 1/4 cup pitted oil-cured black olives or kalamata olives, and garnish with 2 tablespoons coarsely chopped fresh basil or parsley. 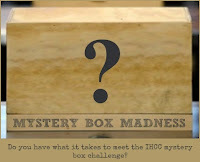 "Mystery Box Madness : April 2015", the theme for this week at I Heart Cooking Clubs (IHCC). 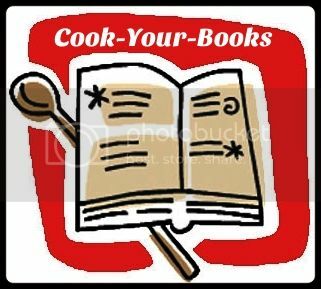 We are given ten ingredients and are required to select at least three out of the ten, to make a dish using the recipes from any of IHCC featured chefs, past or present. The ten ingredients for this month are : Scallops, Tarragon, Sour Cream, Walnuts, Capers, Asparagus, White Beans, Gruyere, Yeast and Rice. Found the perfect recipe from The Kitchen Diaries II by Nigel Slater. I was going thru the recipe and happy to note that there is rice, asparagus and quite a number of different herbs used, but there's no tarragon, and was thinking of adding it in. Upon reading the notes by Nigel Slater at the top of the recipe, he did mention that ".....I would probably swap the gentle aniseed charms of chervil for the more punchy notes of the tarragon. This time I added small leaves of sorrel because I happened to have some, but they should be considered a treat rather than being essential to the recipe". I was smiling with glee, as this week's MBM is quite challenging, as I am unable to find recipes which uses at least three out of the ten ingredients together in a recipe, except for one more, Donna Hay's "Tarragon Chicken and Ham Pasties", but the recipe uses Gruyere, which I am unable to find and even if I can find it, it will be very expensive! I made this for our weekend simple dinner and it was delicious. Recipe uses leftover roasted chicken, but since I do not have that, I roasted a whole piece of chicken breast meat, seasoned with olive oil, salt and lots of black pepper. Then I tear it into chunks and used it the recipe. When I was at the supermarket getting the tarragon and thymes, I've forgotten to get some parsley and mint. So I have omitted them. This is a really easy rice meal to prepare. Firstly cook the rice ; heat up some butter, stir-fry the bay leaves, and thyme leaves until fragrant, add in the basmati rice. Stir for a minute, add in water to cover, close the pot, and simmer for 15-20 minutes until the rice is done. I cooked two cups of basmati rice using one cup of homemade chicken stock and the balance with water to make 3-1/4 cups of water/stock in total. After 20 minutes of cooking, turn off heat and leave rice undisturbed for 10-15 minutes. While the rice is cooking, prepare the asparagus. Cut up the asparagus to short lengths and steam for a few minutes just until tender, refresh in cold water immediately. I have however, microwave them on high for 2 minutes (easier, faster and less pots to wash! ), and then refresh in cold water. Drain before use. Fluff up rice and mix with the rest of the ingredients ; asparagus, chicken chunks and herbs. I've chopped the tarragon leaves and used about 2 tablespoons in total. Tarragon is quite strong in taste, so add accordingly to taste. Season with salt and pepper. Recipe uses lemon olive oil, which I do not have, but I do have olive oil infused with fig leaves, so I used that instead. There's a yoghurt sauce in the recipe which is supposed to spoon over the rice pilau before serving, but I have omitted the yoghurt sauce. This is a simple, easy, and delicious rice meal. I love the simplicity of preparing this meal. Any herbs can be added in. I will definitely make this again, and will make sure that I have some fresh corianders around, which I'm sure will add a more fragrant and wonderful taste to this rice meal. If you do not have any leftover roasted chicken, you can roast a large piece of chicken breast (like I did) or a few pieces of thigh meat, seasoned with salt and pepper, the day before, warm it in the oven for a short while before using it in the recipe. Trim the asparagus and cut it into short lengths. Boil or steam for four or five minutes, till almost tender. Drain and cool quickly under running water. Wash the rice three times in cold water, moving the grains around in the water with your fingers. Warm the butter in a small-to-medium-sized saucepan, add the bay leaves, peppercorns and thyme leaves and stir them around in the butter for a minute or two, until the fragrance wafts up. Drain the rice and tip it into the warm herbs. Cover with a couple of centimetres' depth of water and bring to the boil. Season with salt, cover with a lid and turn the heat down to a simmer. Leave to cook till the rice is tender but has some bite left in it, about fifteen minutes or so. Set aside with the lid on but the heat off. Tear the chicken into large, jagged pieces and put them into a large mixing bowl. Trim and finely slice the spring onions. Chop the parsley and mint. If you are using sorrel, shred it finely. Pick the leaves from the chervil and add to the chicken with all the other herbs. Fluff the rice up with a fork. Tip the warm rice into the herbs and chicken, add the steamed asparagus and toss gently with the lemon oil. Correct the seasoning to taste with salt and pepper. The mixture should be light, green and fresh. "Mystery Box Madness : April 2015". This week at Tuesdays With Dorie (TWD), the selected bake is Limoncello Cupcakes. Of course, one of the ingredient is Limoncello, a lemon liquor. Limoncello has been on my list of to do for quite a while (have seen some recipes using it), and it still is on my list (.... too many "to-dos" on the list!). I have not seen Limoncello in the liquor stores around my area. I have however seen vodka with lemon, but it really is not the same, as Limoncello is sweetened by a simple sugar syrup. So I have substitute the Limoncello in this cupcake recipe with lemon juice instead. It definitely is not the same, but it works out fine. The cupcake batter is pretty easy and quick to put together. The dry ingredients are mixed in a small bowl, the wet ingredients are mixed in a larger bowl by following the instructions which goes in first, then the dry ingredients are combined into the wet ingredients. The batter is then divided in muffin cups. According to Dorie, we can add marmalade to the centre of the cupcakes, put a large spoonful of batter into each cupcake mould, drop a teaspoon of the marmalade into the center of the batter and cover with the remaining batter. Or we can skip the filling altogether. I have decided to omit the filling. Bake the cupcakes for 20-25 minutes (mine was done at 23 minutes), until golden and a skewer inserted in the centre of a cupcake comes out clean. Prepare the simple sugar syrup while the cupcakes are in the oven. As soon as the cupcakes are done, brush them with the sugar syrup and let cool completely before frosting. I poked some holes over each cupcakes before brushing the syrup over. The frosting is made by beating the confectioners' sugar and butter until the mixture comes together and lemon juice and limoncello are then added in, continue beating until smooth and fluffy. I have replaced the limoncello with milk. And the frosting is yummy! So lemony, not too sweet and it holds its shape really well. I made the full recipe and got 10 cupcakes instead of 12, maybe because I did not use any filling in the centre and made them as plain cupcakes. These cupcakes are really nice, moist, lemony, not too sweet and the frosting is just perfect for these cupcakes! I am not one who would usually frost my cupcakes, but I'm so glad I did for this! To view the other bakers take on this cupcake, do stop by Tuesdays With Dorie (TWD), better still, get a copy of Baking Chez Moi, and join us! I have some leftover egg whites when I made some ice cream last week, and remembered this recipe that uses only egg whites, Financiers, from Bourke Street Bakery cookbook. These financiers are topped with fresh strawberries, but I've used frozen strawberries instead. Simple, easy and the batter takes only minutes to mix. Recipe makes 12 financiers which are baked in a 12-hole muffin pan. I have made only half a recipe, as the leftover egg whites are enough for half a recipe. And I've used a muffin pan with slightly smaller holes than the regular-sized muffins, and yield 8 financiers. I've reduced the icing sugar slightly, used only 100gm for half a recipe. Bake the financiers until they are golden brown. These financiers are really moist, tender and yummy. Makes the perfect tea-time treat. Preheat the oven to 190C (375F/Gas 5). Lightly grease a standard 1/2 cup 12-hole muffin tin with butter. Put the ground almonds, flour, icing sugar and baking powder into a large mixing bowl. Add the egg whites, a little at a time, whisking well after each addition. Pour in the melted butter and whisk through until just combined. Spoon the mixture into the holes in the prepared tin until they are almost full. Gently place a strawberry half into the top of each financier. Bake in the oven for about 30 minutes, or until they are golden and a skewer inserted into the centre comes out clean. Turn out onto a wire rack to cool and serve. 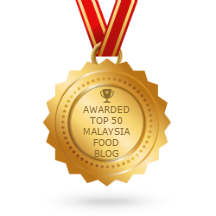 I am linking this post with "Best Recipes For Everyone event, "Fun With Almond April 2015" host by Fion of XuanHom's Mom Kitchen Dairy and co-host by Doreen of my little favourite DIY.